Anytime that someone asks me what my favorite monetization tool is when it comes to blogging, my answer is always ShopStyle Collective. Not only have I had a ton of success with Shopstyle, but it's also really fun to use and with features constantly being added, they really never fail to disappoint. I see a lot of people asking in Facebook groups, etc. how to use it, what it is and how to be successful with it, and considering I've had a ton of time to learn it and find out what works best, I thought a detailed guide to using Shopstyle was completely necessary! ShopStyle: regardless of your blog size, you can do well with ShopStyle. You can also sign up and begin earning right away, rather than applying and being added to a wait list. ShopStyle works on a pay per click basis. This means that for every eligible, legit click you get on a link, you earn a commission. Different items have different payout amounts - it varies by item, how many clicks you get, the type of item and your history with ShopStyle. The money you make is yours; once you earn it, it won't be taken out of your account (you'll see why I mention this in a minute). *No data via Rewardstyle yet - I just was accepted/haven't used it - but I wanted to show what the dashboard looks like! Rewardstyle: while it's common on Instagram with "liketoknowit", Rewardstyle pays out on a pay per sale basis. However it still isn't that easy - when you do make a commission via Rewardstyle, the sale will go into a file called "open commission" for around three months (90 days). This is so if the purchase made by someone gets returned, the commission you made then gets subtracted from your account balance. Upon reaching the payout threshold of $100 worth of "closed commission sales", you'll get paid. I think both networks have pros and cons, but if you ask me - it seems like ShopStyle has more pros than cons. Many bloggers - myself included - post product links or outfit ideas and even home decor and accessories. When readers are curious about where to get an item, how much it is, etc., it's likely they'll click to know. ShopStyle is pay per click, so this potentially will be one of the largest sources of your ShopStyle account's balance. Clicks are nice with Rewardstyle links, but it doesn't guarantee a sale: think about how many times you click on a link, see where it's from and forget about it. ShopStyle is also best to use when you're sharing products from a sale - like the Nordstrom Half Yearly sale or a Friends and Family sale. On the other hand, Rewardstyle may be more beneficial if you're sharing gift guides during the holiday season; more people are likely to buy on impulse during this time of year. Both ShopStyle and Rewardstyle run on website cookies; which "drops a cookie" until a new one is clicked. These two networks' links cancel each other out, and as soon as you click on a different affiliate link, the cookie disappears. It's also important to note that it's sort of frowned upon to use both networks on your blog. Meaning, if you're using both ShopStyle and Rewardstyle links on your blog, the two sort of cancel each other out. It's called a "cookie war". 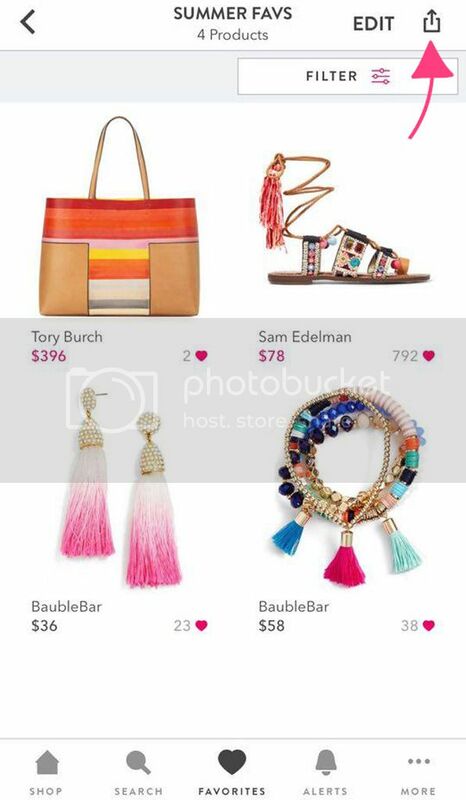 Using ShopStyle on your blog and Rewardstyle on Instagram is different though! On a side note, it's sort of funny because as I sit here and type this, I got an email that I was accepted to Rewardstyle. I applied when I first started my blog and was denied (obviously, but I didn't know any better!) and now I applied so I could 1. get a better idea of how it works to write this post and 2. to *possibly* use it for Instagram. Instagram is the biggest pro for Rewardstyle if you ask me - "liketoknowit" is very popular and I think it is in fact a good tool to use for Instagram in some cases. Moving on. You can see your account analytics and even determine which products are doing the best on each platform you share them on. If you use this page correctly, it's super helpful in learning how you're using ShopStyle and how you can use it more effectively. On the top left you'll see the "sold out notifications" button; this is a fairly new feature and it is SO helpful. Clicking this allows you to view any item from the widgets you've created that are sold out. You can even update the widget and find something similar to replace the item with from this feature. I try and use this once a week to make sure that everything is up to date! Scroll down a bit on your analytics page and you can see what products are doing the best by brand, retailer, product and category. Categorizing by brand is my favorite because I can see what my readers like most and what products I should try to use more if I want to increase my ShopStyle engagement. 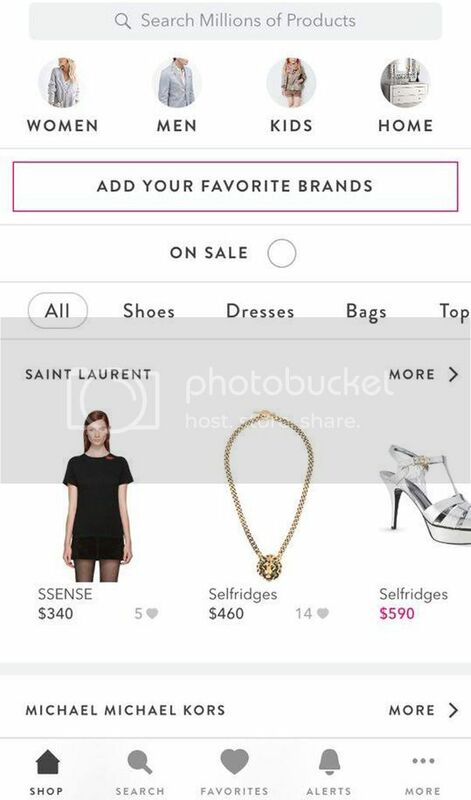 These categories are extremely helpful and you should be using them and checking them each time you log into ShopStyle - I didn't start checking these for a while and I wish I would have sooner because it is a HUGE help! Searching ShopStyle is likely the feature you'll use the most. Here is where you'll search through the thousands of products that are ShopStyle enabled and also can copy a link individually. If you're searching for something specific or a specific category of items, you can narrow that down too with the drop down menus on the left titled retailer, brand, category, etc. 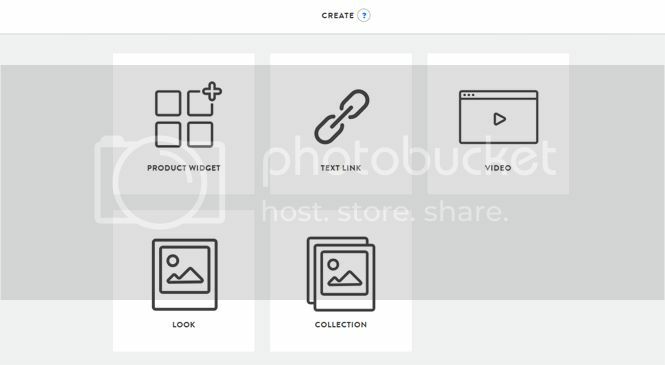 This page shows you all of the product widgets you've made and allows you to edit/update them too. As you can see I'm not very good about organizing these because I don't normally name my widgets, but I highly suggest naming them! It's much easier to go through and see what you have if you want to re-use a widget for any reason or edit a specific one. Here I chose a table from Pottery Barn and clicked my "linkit" button. Upon clicking it, this comes up atop of the page you're on. You can simply copy the link, or you can add it to a product widget (new or existing), favorite it or pin it. I'll get into Pinterest x ShopStyle later on, but this is a seriously awesome option! Once you have all of the products added, click "build" in the top right corner. There are three main important things to notice/edit on this page. First is the display; pick and choose what information you want showing about your product. Remember, many people click on images from widgets to see where something is from - so you may not want to include that information. Sometimes prices are beneficial for things like "steal vs. splurge" posts or sale posts, but this is totally up to you. I tend to have all of these options unchecked and just have the image - I like the clean look to solely images in the widget. Next is the widget size and row/column section. **You want to choose your row and column size before changing the widget size so that nothing moves out of place; once you have the rows and columns how you like them, go ahead and set your widget size. Keep in mind the width of your blog when choosing a size and try and stick with it for each widget you create. For me, my widgets are always 675 pixels wide (I don't really mess with the height, as the two correlate). Finally is the "edit" option. This allows you to move around the products in the widget so you can choose which items are shown first. I love playing around with this section and choosing which products show up where. When you're happy with your widget, click on "publish" on the top right and copy the embed code. You'll want to paste this code in the HTML section of your blog post - and if you don't work in the HTML section normally, add the widget last before publishing the post. It's that simple! 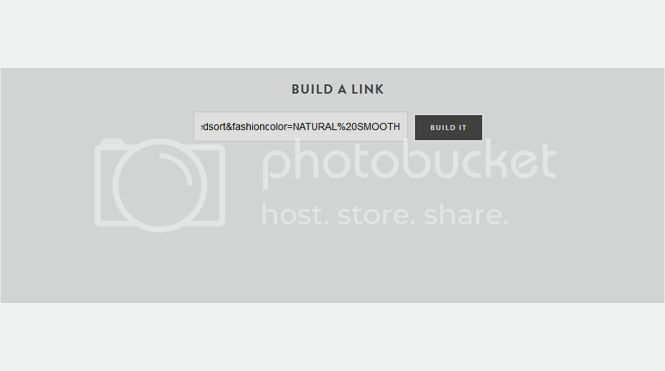 Click on "build it" and simply copy the now ShopStyle enabled link and paste it into your post! As for creating a video - I've never done it with ShopStyle because I don't vlog (although I wish I had the courage too - props to all the vloggers out there!) but you can upload a YouTube video and embed the video with ShopStyle enabled links. Upon clicking create video, there's a detailed step by step process to upload your video and add product tags - pretty cool! Next are the looks and collections - which I'll get into in just a bit! A lot of people ask me why I prefer ShopStyle and why I'm "close minded" about using other platforms. Honestly, I've tried all of the bigger and more well-known platforms. Since I began blogging, I started learning about these networks and I haven't loved one more than I love ShopStyle. It's super easy to use and there are endless ways to monetize with it. I don't want to bash any other networks specifically because I know there are tons of success stories with them - but some of them require a LOT more work and who has the time to let making affiliate money be hard?! I sure don't! As I mentioned, ShopStyle is pay per click and it really doesn't get any better than that. While Rewardstyle may be a bit more known, I like reaching the payout threshold often - instead of waiting for people to actually purchase a product from me. ShopStyle isn't paying me for saying this, I just truly LOVE the network and have had SO much success on it and I want to see everyone have that same success too! First you want to create a collection. Since this is for your Instagram posts, you can call it something along the lines of "Instagram Shop". This makes it easy to monetize your Instagram posts via your blog. *It's important to remember, you must create a collection to "hold" your looks! Click create - collection - name the collection - press save. Once you save your collection's name, you can copy the embed code given. *Another note, I use Blogger, so I'll be showing you how to do this on the Blogger platform. If you use WordPress, you can find a detailed tutorial here. On Blogger, head over to your pages section and create a new page. 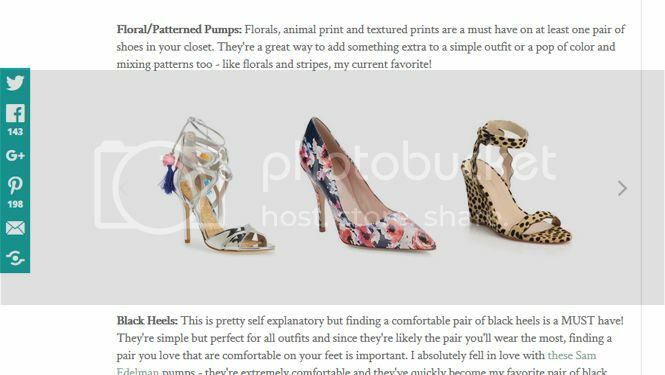 Paste the embed code given by ShopStyle in the HTML side of the page. Once you upload your image, you can add a caption and hashtags if you want to. I like to caption it with what I did on Instagram and add a few simple hashtags. When you're happy with how it looks, click "publish". Here you'll see all of the looks you create for any collection. For the sake of this tutorial, I only have this one listed that I just created - and I actually am still in the process of creating my Instagram shop on my blog! 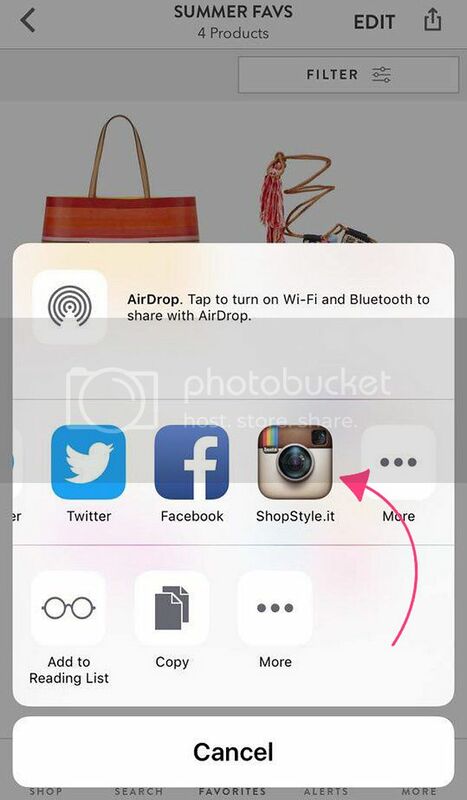 Aside from implementing looks and collections from Instagram on your blog, you can use ShopStyle's feature, SHOPSTYLE.it! This works the exact same way that Rewardstyle's "liketoknowit" works. *Note that I'm using an iPhone for this! Click the highlighted button (see above) and add the product to a list. You can add it to an existing list, or create and name a new one. Do this repeatedly until you have all of the products you want to have added. When you're done, click favorites (bottom bar) - lists (top right). Select the list you've been working on. Voila! 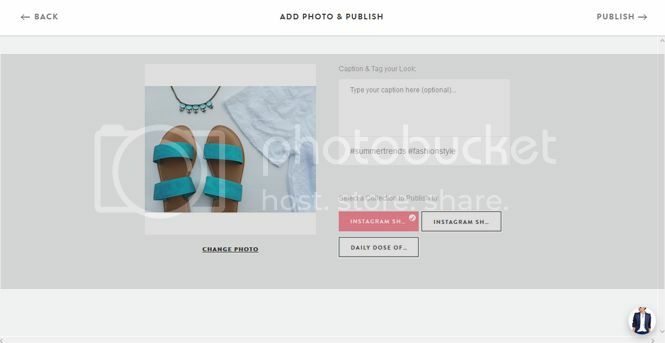 You can now let your readers/followers shop your Instagram posts! And the same goes for Twitter! 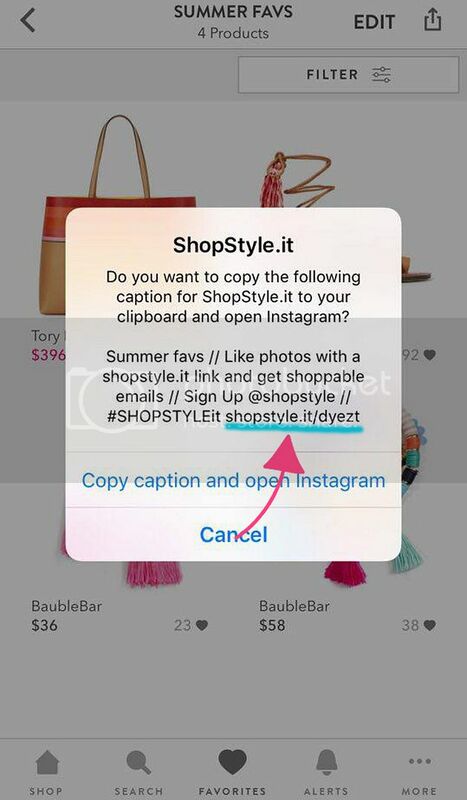 Or even if you want to share a new product you found and loved - sharing it via ShopStyle is THE way to go. From here, you can also link to other outlets not mentioned here like Tumblr, straight to your Blogger/WordPress site or even in an email! Pretty cool huh?! 1. What do you do when a product isn't supported by ShopStyle? - You can do one of two things: leave it as a regular link, or find something similar to link. I usually like to do both! This way you can still share the exact product with your readers, but leave room for them to keep clicking around by providing them with other similar items they also may like. 2. 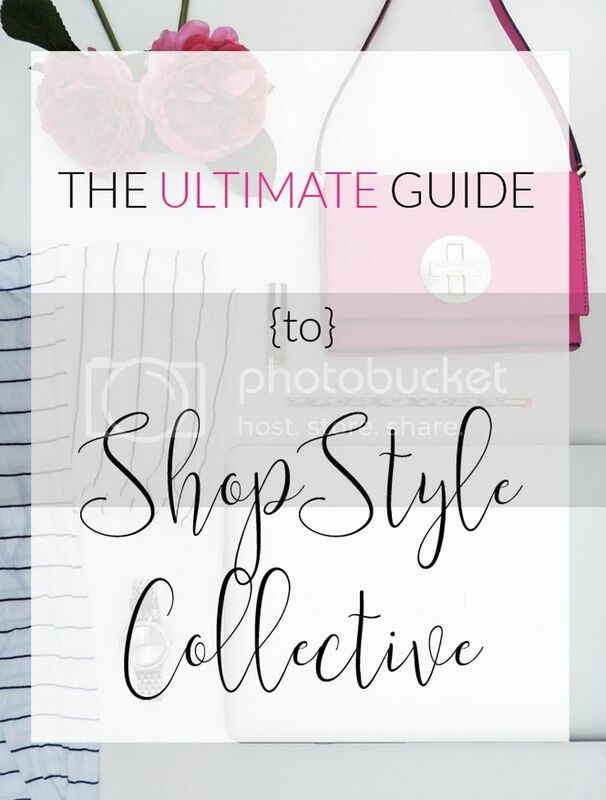 Can you use ShopStyle Collective if you don't have a blog or a website? - Yes!!! That's the best part. 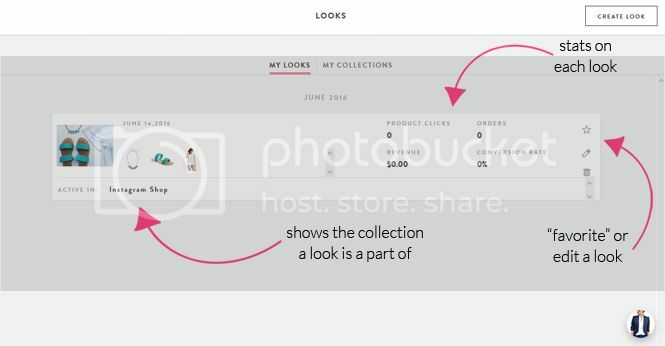 I know a few people who haven't launched their blogs yet or just aren't interested in having a blog/site right now, using Shopstyle.it is a great way to keep monetizing and using the platform anyway. It's also smart so that you have the account going, the momentum and the following in case you do decide to launch a blog one day! 3. What's with the new Snapchat features? - The newest feature from ShopStyle Collective (they're always rolling out new things, it's awesome!) is Emoticode. You can read a super in depth post about Emoticode and watch a video on how to use it here! I haven't tried it yet, but I think it seems like a great idea! ShopStyle Collective is such a large and varied affiliate network and there are SO many things you can do with the site! They're always updating it to make improvements, add retailers to their ever growing list and adding features super often. Whether you're already monetizing your blog with ShopStyle or are looking for a new affiliate network to join and try, make it ShopStyle! I would love to help answer any other questions you have about it; when I first started using it, I wish I had this guide to help me through learning everything. The network is super helpful and easy to use and no matter who asks me if they should use it or if it's a good network, I never have anything but positives to say! This is an awesome tutorial! I am all about affiliate networks at the moment, because Ive seen so much success with them lately. Shop style looks really well designed too! Can't wait to use it. This is the first I have heard of this, but it sounds like a great and really well designed program! Omg this is awesome! what a great tutorial and sounds like an easy way to make a little extra coin! This is awesome!! Thanks so much for sharing this! I've never used it but you have me intrigued! I love affiliates and this is the first I've heard of this one. I LOVE how you gave an in-depth tutorial. It's so easy to follow along. Such great tips! I haven't heard of Shop style but I am going to check it out! I have never heard of this company before, but it sounds like it could be could commission for someone that knows what they're doing. This is amazing and so thorough! I have only been using text links, but I am totally going to expand what I'm doing. Can't wait to start making some widgets! I LOVE shopstyle and after being frustrated with RS I definitly think I'm sticking to it. Thanks for sharing this guide! This is the first I've heard of this, but you're guide is definitely helpful! I have never heard of ShopStyle before, but it sounds like a great way to earn some extra money. I like that it is pay per click. I think when it comes to shopstyle, it can really help promote the product. The rewards style may come up smaller in number but bigger rates on the purchase. This is such an excellent, in-depth guide! Thanks so much for putting it together! ShopStyle sounds awesome! Oh my goodness, this is SO informative! Thanks so much! I'm saving it to come back to to pour over again! WOW! This is such a good guide. I love trying new ways to monetize my blog but normally I need to stumble through it. This is perfect. I've been using ShopStyle since I've started blogging and I still don't have the hang of it. Thanks for all the great tips and tricks! Amazing post, thank you! I use Shopstyle but you've given me some serious help on how to expand the ways I use it to generate more income. Wow! I haven't heard of ShopStyle before, but it sounds like a great program. This is a very explanatory post and very informative, too! Thanks for sharing! This is such a great resource for people who don't know how to use ShopStyle! Great post, girl! I have never heard of this program. I will have to check it out! This is such an awesome, in-depth guide! I used ShopStyle for a while but switched to RewardStyle. I think I'm going to start using ShopStyle for my blog! This was a really awesomely thorough breakdown of two different affiliate programs. It seems like Shopstyle is a great option for someone liek me! Such an interesting take on it. I actually use rewardStyle and I LOVE it. In the time it took me to earn $40 on ShopStyle, I earned nearly 3x that. Plus, I've found that more people use liketoknow.it than the ShopStyle equivalent. I've looked into doing ShopStyle on the blog with liketoknow.it on IG, but I really love the commission-based structure. Shopstyle collective's website alone is the best of the bunch! SO simple to use and I like that you don't have to apply. 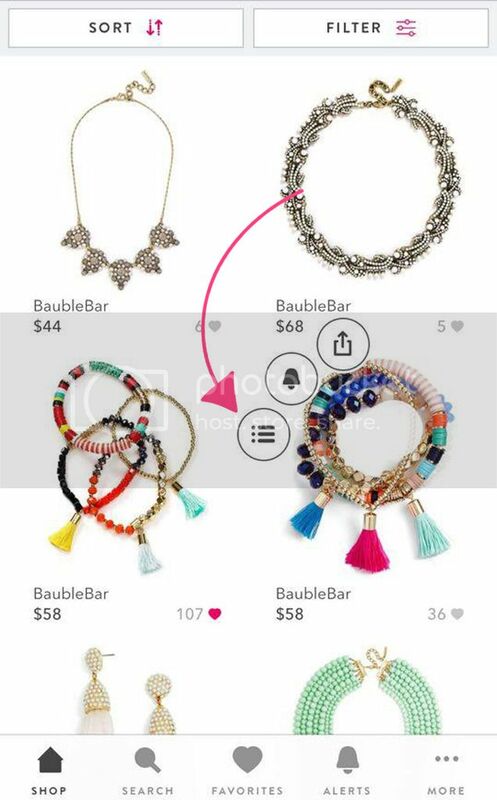 I've used shopstyle before and it's very easy to use! what a very cool way to shop. You can definitely be an informed consumer using ShopStyle. There is seriously SO MUCH good information here! Thank you for laying it all out. I get so frustrated sometimes trying to figure it all out. Definitely saving this for reference! This sounds like a really great way to monetize a blog with affiliate sales. And you make it really easy to get started! Wow, girl! This is such an amazing guide to shopstyle! I am a member of both Shop Style & Reward Style and I think you did a great job pointing out the pros & cons! I've been using Reward Style for a while now, but I think I might go back to ShopStyle! I LOVE ShopStyle, this post is so helpful. Loved reading this! Great, detailed tutorial! Love it. I'm not for affiliates, as I think it takes too much time all to make nothing. I do wish blogger's would disclaim at the tops of their posts when they use affiliates! Thanks for explaining how ShopStyle works, I'm definitely going to check it out. This is great, thanks for sharing ShopStyle as I had not heard of it yet! Thank you so much for this!!! This was so helpful and I've learned so much! 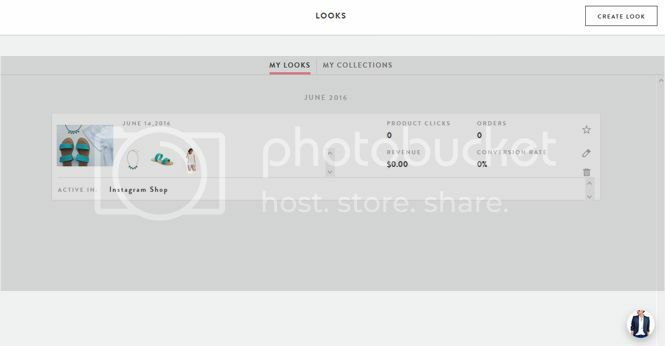 I've been using ShopStyle for a few months now but only have been really familiar with one feature. Thank you again!!! Pinning this ASAP. It's so helpful! I used to use ShopStyle a lot before getting accepting RewardStyle. I still use it for the search feature because their interface is a lot easier to get the hang of than RewardStyle's but I do love RS because I make more money usually. Liketoknowit is pretty great though. 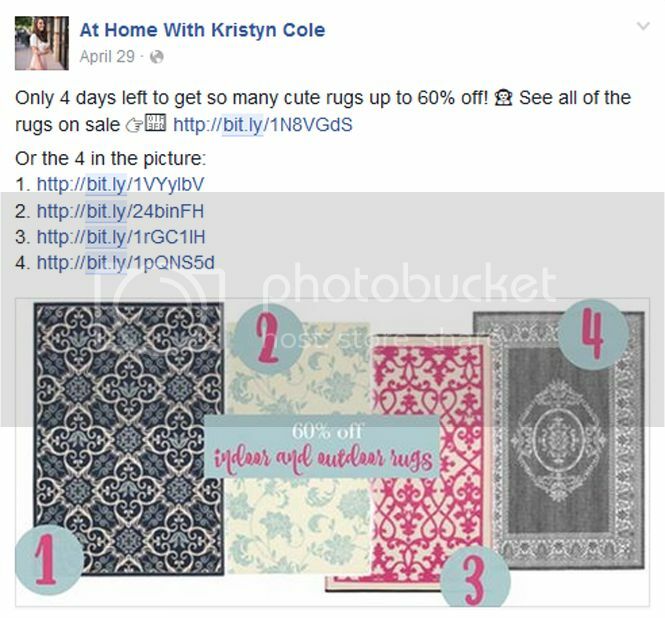 Shopstyle collection sounds like a great affiliate network. I do believe that it is important for any blog to use an affiliate program to make more money. It can also help with bringing in a bigger audience. This is such an awesome post!!! I never thought to post ShopStyle images to Pinterest!! Thanks for this info! I've never heard of Shop Style but this looks great and SO easy. I love how easy it is to upload to instgram and Pinterest. thank you for the tutorial! This is such a fantastic post. I've been using Shopstyle for awhile and I love it. But using on Pinterest? Duh! I also really want to look into using the looks feature as well. Thank you so much for sharing all of this really helpful information. Great post. Sounds great but I no longer do affiliate marketing so I'll be passing on this. However I have a friend who signs up for everything so I'll pass this along to her. Wow what a great post of valuable info! I can tell you put a lot of thought into this and it's very well done. I've never heard of shop style before but it definitely looks like an interesting affiliate source! I'll have to share this with my beauty blogging buddies! Such an in-depth post - I love it! I like RewardStyle more at this point I think, but I really want to know more about ShopStyle's work with sponsored posts with bigger influencers, like Caitlin of Southern Curls and Pearls and Emily of The Sweetest Thing blog. They're constantly doing sponsored posts in collaboration with ShopStyle, and Lordy I wish I could get on that hotlist! ShopStyle sounds very rewarding. I like that its pay per click so it can bring in a nice amount of income. Yay to Affiliate Marketing!Been hearing a lot of feedback about ShopStyle and it won't hurt to give it a try. Thanks for sharing this opp. I'm wondering how exactly to add a product not found or supported by shopstyle to a collection? I just can't figure it out! I just started using ShopStyle a couple months ago and this was incredibly helpful! This is such a great article! I've been stepping up my game with my Shop Style affiliate account lately but was wondering if you could help me out with something... say you want to link to old navy but be more broad, like link to the entire toddler section because they are having a sale, or link to targets bedding page because it's all on sale, do you know how to create that type of link? I've seen it so I know it can be done just not sure how! Would it be the build it tab? Thanks!! Wonderful article. I will have to read it again before I attempt to take on this task but it is coming. Thank you for sharing. This seems like a great article , however none of the photo attachments are showing up. I would like to learn how to use this effectively. This was super helpful, thank you so much! Picking one out of many fashion jobs generally is an overwhelming challenge. There are several different opportunities in the fashion industry that you might not be sure which one is best for you. The role of a social media manager has appealed to the mass generation of socially-active internet users. A "female appraiser" is the female in our life that we always imagine envying us and complimenting us when we try on new clothes. What is the minimum requirement for Shopstyle to approve you to use their collective? I used my facebook account that I created a long time ago that wasn't active and it doesn't have a lot of followers because I was inactive. Is that what they look at? Because I have more Instagram or Twitter followers. Is that what I should have used to sign in instead?